At the time my father, Verne Hoffman, gave his presentation on Rev. George Tarvin and the Dunker Religion at the 1988 Tarvin Family Reunion (see our online transcript), he reported that he had received considerable assistance from Dr. Emmert F. Bittinger. He said that Dr. Bittinger was preparing a history of Dunkers in the western Maryland and Virginia area, referred to as the West Marva District. 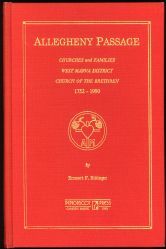 Dr. Bittinger's book was published in 1990 under the title Allegheny Passage. Its subtitle is: Churches and Families, West Marva District, Church of the Brethren 1752-1990. Verne immediately purchased a copy and when Verne died in 2004, that book came into my possession. When I read the book, I was pleased to discover that the chapter on the Cacapon Settlement contained rich information on the Tarvin and related families. In preparing his history of the Dunkers in the western area of Maryland and Virginia, the author had discovered that congregations in certain areas no longer existed. Since church records were not kept at the time, Dr. Bittinger turned to genealogical and land records to establish relationships that might imply the size and scope of particular congregations in their early days, especially those no longer extant. His correspondence with Verne Hoffman about Rev. George Tarvin's ministerial activities in Kentucky was one of the triggers that led Dr. Bittinger to delve more deeply into the land transactions and marriage relationships among the inhabitants of Hampshire Co., Virginia (now West Virginia) to establish probable Dunker adherants in the late 1700s where there are few today. To read Verne Hoffman's 1988 presentation, go to the document Rev. George Tarvin and the Dunker Religion.